I love this! I will definitely have to try it. You could also add essential oils for different scents! Would this work with Johnson’s No More Tears? My little guy is just 2 and shampoo will sting his eyes. 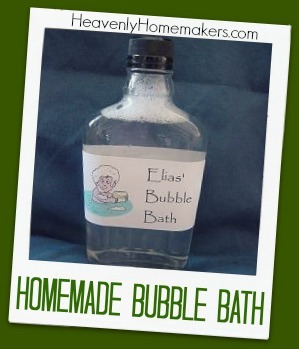 I’ve been wanting to get him some bubble bath and this looks easy enough to do. I’m curious what the role of the salt is. The salt restores viscosity and some resistance to bacteria after dilution with the water. Or you can just skip the water and the salt and get the same effect from the shampoo alone.